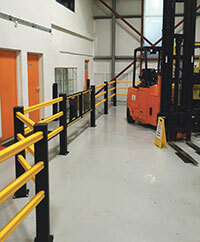 Pendle Forklift Services of Earby in Lancashire have chosen Boplan HP Plus pedestrian barriers to protect staff, trainees and visitors at their Forklift Training Centre. Made from flexible polymer, the HP Plus handrails are the strongest version of the Boplan FLEX IMPACT® handrails. By adding a third extra horizontal rail and heavier posts, they safely separate and shield pedestrians from high-risk traffic zones where constant heavy manoeuvring takes place. The barriers are made from a polymer which is flexible and shock absorbing. They will absorb impacts safely and then return to their original shape and position with no loss of ongoing performance. Also, the damage caused to the FLT will be far less severe than if it hit a metal barrier. The impact to the driver is reduced, minimising any injuries. To ensure that the product is backed by an equally high standard of service, Boplan has opened an office in Wolverhampton to deliver a local service for the UK.